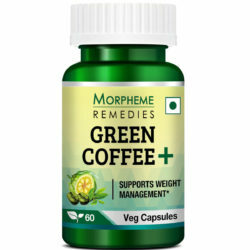 Morpheme Remedies Garcinia Green Tea for Weight Management brings together the beneficial effects of both Garcinia Cambogia and Green Tea. It contain only pure extracts of Garcinia Cambogia and Green Tea. These veg capsules could help break down the excess fat in the body and also assist in reducing further fat accumulation. Morpheme Remedies Garcinia Green Tea helps in weight management, helps improve the metabolism when taken along with healthy diet and exercise. They are free of synthetic ingredients and don’t contain any additives, fillers, allergens or gluten. 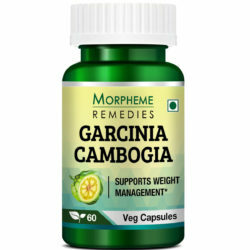 Garcinia Cambogia – also called Garcinia gummi-gutta or Malabar tamarind – is a small greenish fruit that’s usually grown in South East Asia, South India and Central Africa. The peel or rind of the fruit is rich in hydroxycitric acid (HCA) which is known to have weight-loss properties . HCA inhibits the enzyme citrate-lyase in our bodies. This enzyme is vital in converting carbohydrates into fat (a process called lipogenesis). By inhibiting this enzyme, the HCA in garcinia cambogia helps increase fat metabolism and controls weight . It is because of this property that garcinia cambogia is often hailed as ‘Holy Grail’ of weight management. 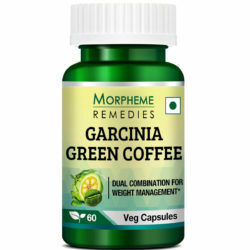 Each capsule of Morpheme Remedies Garcinia Green Tea for Weight Management contains 300 mg of garcinia cambogia extract and 200 mg of green tea extract. This combination is believed to help not just to boost the metabolism, but also assist in reducing further fat accumulation. The extract of garcinia cambogia helps weight management in two ways: firstly, by reducing body fat and secondly by suppressing appetite. 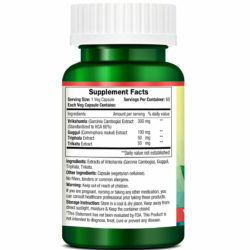 The active compound in garcinia cambogia, HCA, is known to be an appetite suppression agent . Studies suggest that HCA can increase serotonin in the brain . And serotonin is a neurotransmitter known for suppressing appetite . A sense of satiety keeps one from overeating and may lead to weight loss over a period of time. 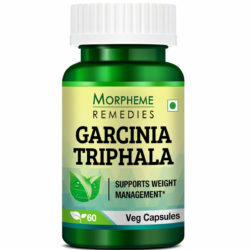 Morpheme Remedies Garcinia Green Tea for Weight Management should not be taken by pregnant or lactating mothers. A person below 18 years of age should not take this supplement. 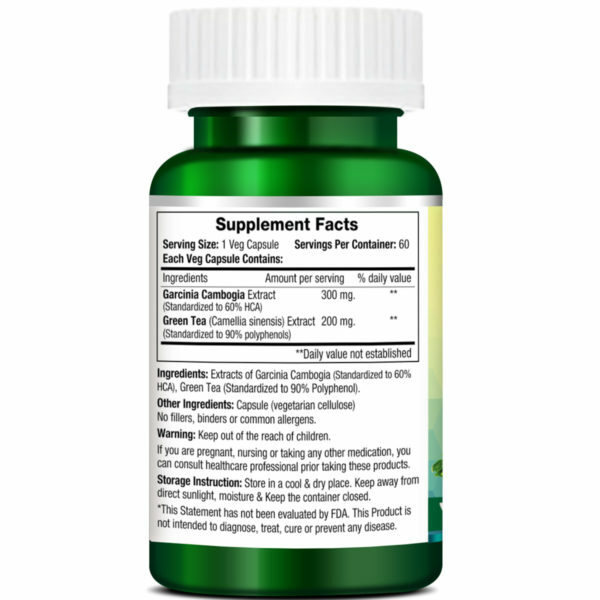 It is best to avoid alcoholic drinks and coffee while you take Garcinia Green Tea supplement. Also avoid skipping meals. 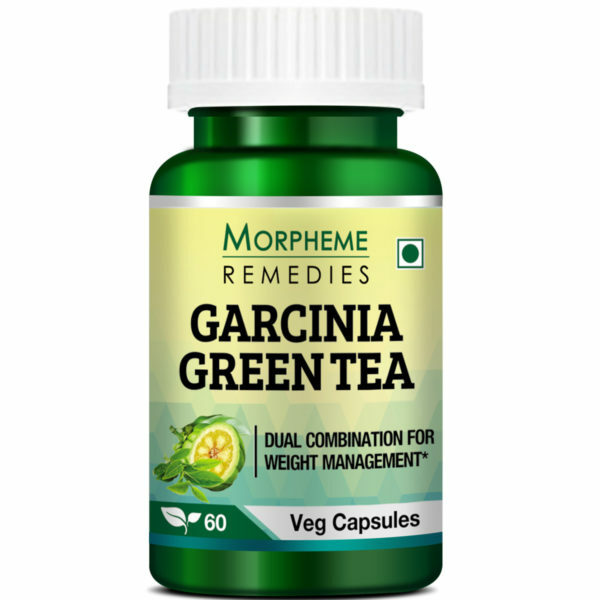 Morpheme Remedies Garcinia Green Tea for Weight Management promotes weight management along with exercise and diet management only. By stomach fat has reduced dramatically after using this product. After I started to take these capsules after the second week I started to notice my belly fat shrinking. After 3 months I have lost significant amount of fat. Guys, it is a wonder; I could burn the extra fat and go slim in just about 45 days. Thanks to this unique capsule. I did not notice any side effects. I am simply amazed with the result. It has helped in controlling appetite and reduced overeating. I has helped in decreasing abdominal fat. There was no side effect. It has helped in reducing my appetite. Now I do not feel the urge to overeat. However, I have adopted healthy eating habits and exercise 5 times a week. I believe that the combined effect of diet, exercise and garcinia-green tea has helped me in losing weight. This is a great supplement for suppressing appetite. It has helped in reducing my hunger and cravings for sweet food. A great metabolism booster too. Garcinia-Green Tea indeed works as described. It made me less hungry. Hunger is now normal during meals and is satisfied easily by eating a small meal. No side effect. 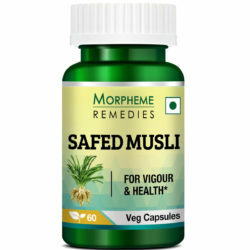 This product helps in weight loss only when you diet and exercise. The advantage of taking this supplement is that it helps in reducing hunger and provides energy to exercise. This product worked for me. However, for the desired result I had to exercise and eat low calorie foods. The appetite suppressing and metabolism boosting effects of this supplement helped in providing the best result. Hunger is now less after taking this supplement. I have not gained weight. But I have not lost weight. Perhaps I have to take it for a longer period or increase the level of my physical activities. I am taking this supplement for a week but there has not been any major change in my weight. However, I am feeling less hungry and slightly more energetic. Garcinia Green Tea supplement is not a magic pill that provides result overnight. You need to take it continuously and eat healthy foods and do workouts to lose weight. It has worked for me. I found this product pretty effective in increasing metabolism. It is helping me in losing more fat. It helps in speeding up metabolism. Although I am dieting and exercising, I have lost more weight after taking this product. This supplement helped in giving my weight loss efforts the boost it needed to lose weight fast. It is an effective appetite suppressant and metabolism booster. There was no side effect. Garcinia and green tea are known to help in boosting metabolism. I am taking this product for quite sometime. I feel slightly more energetic. It has helped in some fat loss. Garcinia-Green Tea is a helpful supplement for weight management. I started to notice the difference in a week as I was feeling less hungry and my energy level had improved. It helps in making weight management easier with diet and exercises. With garcinia and green tea combined together, this supplement has eliminated the need to take two separate supplements for weight management. I found this product useful for weight management. This supplement is a good appetite suppressant. It helps in reducing overeating. It also helps in increasing physical stamina. This is a wonderful product for weight management. Instead of taking two separate supplements, I am taking this product that contains both garcinia and green tea. It helps in boosting metabolism. 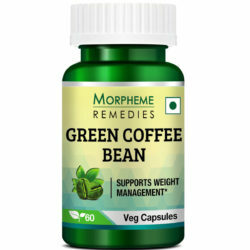 Helps in weight management. Good energy booster. This has been an effective product for controlling appetite. It helped in speeding up metabolism. I am manage weight and feeling healthy. Controlling appetite and fatigue are two common obstacles in weight management. By taking this garcinia and green tea supplement, I realized that it helps in addressing both these problems. I am taking this supplement for the last 3 months. It is assisting in weight management. Helped restore normal appetite and metabolism. Garcinia-green tea supplement helped in restarting weight management that reached a plateau. Now I can exercise for longer time and burn more fats. These pills gave me the energy I needed to exercise and lose fats fast. They helped in boosting metabolism. For controlling appetite and speeding up fat loss this is the ideal supplement. Though dieting and exercising are important for weight loss, this supplement makes them more effective. This supplement has helped in reducing overeating and restored normal appetite. It has been good for my body’s metabolism, as I am losing fats after taking this product. This supplement has helped with my hunger pangs. Dieting has become easier for me. My body’s metabolism seems to have improved. This product provided that extra boost I needed to lose weight. It helped in controlling hunger and made me eat less without causing any side effect. I am feeling better, my mood has improved, my energy level is higher and I am losing weight. After taking this supplement I realized that a good product does help in weight loss when combined with diet and workouts. It helped ease the process. This product helped in suppressing hunger and increasing energy level and burning fat. This is a wonderful supplement for safe weight management. It helped in suppressing my appetite that helped me stop overeating and reduced cravings. It’s been a good energy booster and fat burner. It supports weight loss when you use it the right way. This supplement supports healthy weight loss. It helped in making me feel less hungry and is assisting in breaking down the fats faster. This supplement has given me that extra energy I needed to lose weight fast. It helped in controlling appetite and improved mood. I am taking this product to speed up weight loss and it has helped so far. It has helped in suppressing appetite without any side effect. 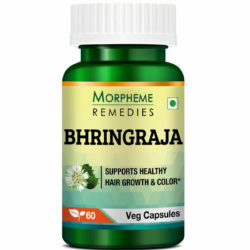 It has helped in increasing metabolism and energy. This supplement is helping me in losing weight. It helped in speeding up weight loss with diet and exercises. The supplement is helping me in burning fats. I lost more weight in two months with diet and exercises after I started taking this product. It even helped suppress appetite. This product has helped rev up my body’s metabolic rate. It is helping in burning fats at a faster speed. I feel energetic and my mood has improved. It has helped in killing excess hunger. I used this product before. I’m using it again. It is helping. Other Ingredients: Capsule(Vegetarian Capsule), 100% Vegetarian. No Fillers, binders or common Allergens. Directions: For best results, take 1-2 capsule once or twice a day. The dosage can be altered on the advice of a qualified healthcare professional. 1. Who should not take Garcinia Green? Pregnant and lactating mothers, individuals below 18 years, patients with high blood pressure, cardio-vascular disease, cerebrovascular disease, hyperthyroidism, kidney or liver dysfunction, should not take this supplement. If you have any pre-existing medical condition then it is better to consult your doctor before taking any supplement. 2. Can men take this supplement and achieve same results? 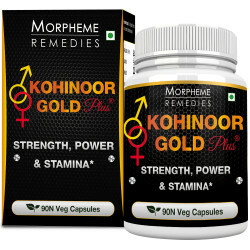 Although the basic body structure of men is not similar to women, the supplement works fine for both men and women. 3. Can I take the supplement during my monthly cycle? Yes. Garcinia Green Tea supplement does not have any effect on menstrual cycle, so you can take the pill without any worry during this period. 4. Who can benefit from this supplement?